Christie-Jo Adams is the Instructional Specialist for Fine Arts for Richmond Public Schools. Prior to this position she taught for fourteen years in Richmond Public Schools and five years in Henrico County Public Schools at Brookland Middle School. She holds a Bachelor of Music Education degree from Longwood University and a Master of Education degree in Curriculum and Instruction from Averett University. Ms. Adams receives invitations to guest conduct throughout the region regularly including the Richmond Symphony and VCU Orchestra Project Project Summer Camp. 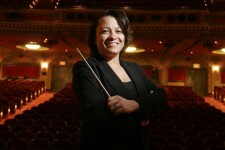 She has served as an adjudicator for VBODA orchestra festivals and marching band competitions. As a violinist, she has been a member of the Petersburg Symphony and The Richmond Philharmonic. She continues to perform with her string quartet, “The Classic Quartet.” She is an alumnus of the Richmond Symphony Youth Orchestra Program, having played in Youth Concert Orchestra and String Sinfonietta.